All the important stuff you need to know to run your society. Got a question? Contact your VPSA for support. Please fill out this form in order to book a venue with DUSA The Union and we will get in touch with you shortly. If Society booking, is the Society affiliated? Any other relevant information that you feel should be provided? If you would like DUSA to share your event, please read the following Social Media promotion guidelines, then complete the online form found on this page. Use this form to request promotional support for your upcoming Society event. Your message may be edited by DUSA. This is not required for promotion, but it helps. This is your first chance to introduce the society before the Freshers’ Fair. The booklet will be circulated all year round – Freshers’ week, University’s Opening Days and simply always there in the Enquiry Centre. So people will be able to know about you before even coming to the University. You never know, you may be the reason they choose this University over others and be a great asset to your society! Holding a stall at DUSA provides your society with another great opportunity to publicise itself/events to the students. Most of the time, the stall will be facilitated outside the level 2 reception or in front of the building. Just drop by/contact the VPSA in advance to ensure your stall will be well-equipped and attended. Postering and flyering around campus is a tried-and-tested method of promoting your events. It is important to put effort into a design that would send a clear message and contain all the necessary information. Just ensure that you receive permission from DUSA and/or University before filling campus with your posters (and remember – no metal pins to the trees!). If you need any help designing or printing materials, contact VPSA. Bear in mind that design requests should be made 8-10 weeks in advance, print – 3 weeks before the posters have to be up. Just creating a website or a social media page is not enough. You have to keep being active. Let everyone know what the society has been up to, post information that is not directly related to the society’s activities but may be interesting for the members. Creating the event page for your events are also not enough. Make as many people as possible invite their friends, share the page and change the profile/cover photo. Make sure both the society and the event are all over the Internet. If you have planned a major or unique event then why not contact the press. A well-placed press release can do the same work as hundreds of posters. Contact the Vice President of Communications and Campaigns (vpcc@dusa.co.uk), who will be more than happy to walk you through the process and put you in touch with the right people. This is one of the most effective ways to keep people updated. You can send information, newsletters and simply organise everything via e-mail. A good idea is to keep all the paper trace in case some misunderstandings arise. We strongly encourage you to use @dundee.ac.uk shared mailboxes – it is connected to your (and fellow committee members’) university’s e-mail account and makes the society look more professional. It is very easy to set up – just e-mail VPSA (vpsa@dusa.co.uk) with your name, position, matriculation number, university’s e-mail address and what address would you like your shared mailbox to have. We will sort the rest for you. Living in the 21st century, you cannot get away from it. Create pages or groups (pick one – having multiples is highly confusing for an outsider! ), tweet; use Instagram and Snapchat, if you wish. This is the least time-consuming means of communication. However, it has to be used wisely and be constantly updated. There is much more content freedom than in an ordinary website, so you can post not only about your own society but more broadly, too. Start discussions and share your thoughts. For a lot (not all!) of students social media is the main way to show off what your plans are and what has been happening in the society. The (Re)Freshers’ Fair is held on the last Saturday of (Re)Freshers’ Week and is the single best opportunity for societies to attract new members. There are thousands of new and returning students attending both fairs and it is your chance to show off and kick-start your year. Want to book a stall? Fill in the form below. VPSA should send the confirmation within 3 working days; if you have not received it or having troubles submitting the information, contact vpsa@dusa.co.uk with all the details as per form. There are a few ways you can raise funds. If, after you collected the membership fees, you find yourself in need for more money, here is what you can do. Bake Sales The way to turn your baking skills into some money! You can organise the bake sales outside the Union (contact VPSA) or in the library (ask library staff about the bookings and availability). Bar Events This is another easy way to earn some money. Pub quizzes, Bingo nights, Acoustic and Open Mic nights, Date auctions, Talent nights, Speed Dating – all you need is an idea and a plan how to bring people to the bar. Contact the VPSA if you want to use this opportunity. Clubnights This is something that requires a big idea, months of planning and a lot of effort. But it pays off when you see the result. If you have an idea that you think would work for everyone, get in touch with the VPSA (vpsa@dusa.co.uk). If you still find yourself in trouble, societies can also apply to receive funding from DUSA to support their activities. The Funding Council is facilitated by the VPSA and consists of the two Societies Representatives on the Student Representative Council and five ordinary members elected by the Societies Council. To request funding, Societies must submit a Funding Application via the online form below. Please fill out this form if you wish to apply for funding. Please scan the bank statement and then upload it. Updated balance sheet on the finances of your Society or a financial statement explaining your financial situation. PDF Only. *Not mandatory for those who have accounts with DUSA. If you have a supporting document please upload it here. If you have more than one supporting document, please zip them into one file and upload that. Any other comments in support of your application. The application will be sent to the Societies Funding Council and you will hear about the decision shortly. Please read through the guidelines below on what DUSA does and does not sponsor. As stated in DUSA Bye-laws (that you agreed to comply with), a society must hold an Annual General Meeting (AGM) each year with the purpose of electing new committee and informing your society members of the previous year’s achievements and financial position. Agree on the date. Most of the societies hold the AGM towards the end of an academic year so the final-year students can do a proper handover. Make sure the date is not too close to the exam period so that the members are relatively stress-free and will attend the event (you need at least 10% of the registered paid members to attend the AGM for any decision to pass). You must announce about the AGM seven days before the meeting. Feel free to invite non-members as well; however, only paid members (that are UoD students) can vote in the AGM and run for the position on the committee. Make sure you have a room booked. It can be the room in which you hold your regular meetings or any other venue. For DUSA rooms e-mail: vpsa@dusa.co.uk, for University’s: roombooking@dundee.ac.uk. Create your agenda and decide who will chair the AGM and take minutes. The President usually takes on the former and secretary – the latter. The Secretary and Treasurer will give an oral or written report summarizing the society’s achievements and any other relevant news. Elections will be held for all Committee positions, regardless of anyone re-standing. Voting is either via a show of hands or a secret ballot; it is advised that you discuss the method prior to the AGM. The minutes shall be submitted for approval to the whole society and sent to VPSA within 30 days after the AGM. In some cases an Extraordinary General Meeting (EGM) may be called. The rules are identical to those of the AGM with the exception being the VPSA should be present if the EGM is for re-election to act as returning officer for a secret ballot. societies accounts (bank statement and/or balance sheet). Handover is incredibly important for successful continuation of the society. The incoming committee really wants to know how you got the society to where it is now, what mistakes you made, how to improve performance and generally, what it takes to be on the committee. Don’t leave them just hanging there! Make sure that the new Committee is given all the banking details and that the signatures on the account are changed. This way, any early-semester plans can not only be funded but are also realistic; there’s nothing worse than having big ideas only to discover that the cupboard is bare. Make sure that any society mailing list and/or society e-mail account is in the hands of the new Committee. This will ensure some level of continuation and allow efficient communication, especially over summer (particularly regarding Societies’ booklet and the Freshers’ Fair). Most importantly, go for a coffee or a pint with the next year’s Committee and answer any question or concerns they may have. Give them the low-down on everything committee – funding, events promotion, share anecdotes, give friendly warnings, and generally impart your worldly wisdom. At the end of every academic year we recognise those who did a remarkable job throughout the year. Read about the six awards below. Nomination open in Semester 2. This Award goes to the society that has been affiliated in the last year and who we believe has made an impressive mark on campus life by organising engaging events and activities, and has brought a new wealth of knowledge to the University. This award goes to the Society that has made the most progress throughout the year, improved their society as a whole, involving more members, having more events and bigger events thaen they have had in the past. This award goes to the society that has been the most active in the past year throughout the University student body and has involved a large amount of the University’s community through various events, information sessions and other activities. DUSA has had this award since 2008, it goes to the society who has planned and executed an extremely successful event which has stood out in the past year. This title is awarded to the society that has made the greatest effort over the past year. Interacting with the student community, organising a range of events aimed at involving a diverse range of student demographic. This goes to the society that has really put the effort into everything they have done this year and tried to make the most of every event. This society would have also engaged significantly in DUSA led events such as the Raising and Giving Week. This award goes to a member of a society that has gone above and beyond the call of duty within their society and that have shown themselves to be an outstanding asset to their society. Members of each society can nominate any member of their society. This award is to celebrate an individual who has made an outstanding commitment to voluntary activities within DUSA, The University and/or the wider community. The winner will have demonstrated their ability to spare time for the benefit of others, whilst remaining dedicated to their academic activities. To bank on behalf of your Society, you must register as the appointed member and provide your student ID and signature to process transactions. 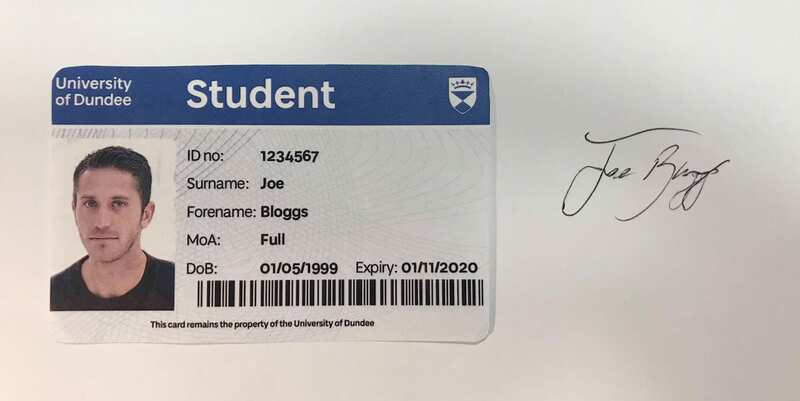 Before you begin this online form, please have a clear photo showing your student ID and signature ready to upload. Please see the above example. To bank with DUSA, an appointed society member must register with us using the following form. How do I open a bank account with DUSA for my society? How can I apply for funding for my society? Please complete the online form found in the ‘Funding’ tab on this page. Make sure you have read the guidelines and include as much information as possible in your application as this will speed up the process and increase your chances. How do I organise a society fundraising event? Before making any plans, please discuss your ideas with the other society members. Once you have decided on a few options, email vpsa@dusa.co.uk to make an appointment to discuss these in more detail. How do I book a meeting/rehearsal space in DUSA for my society? For regular meetings and rehearsals, EGMs and AGMs held in DUSA, e-mail vpsa@dusa.co.uk specifying the time, date, number of people and set up you would require and we will have a look at what’s available. For University buildings and rooms, please contact roombooking@dundee.ac.uk.